Videos, worksheets, stories and songs to help Grade 6 students learn the rules for adding integers. In this lesson, we will learn some songs and rap that will help us remember the rules for adding integers. 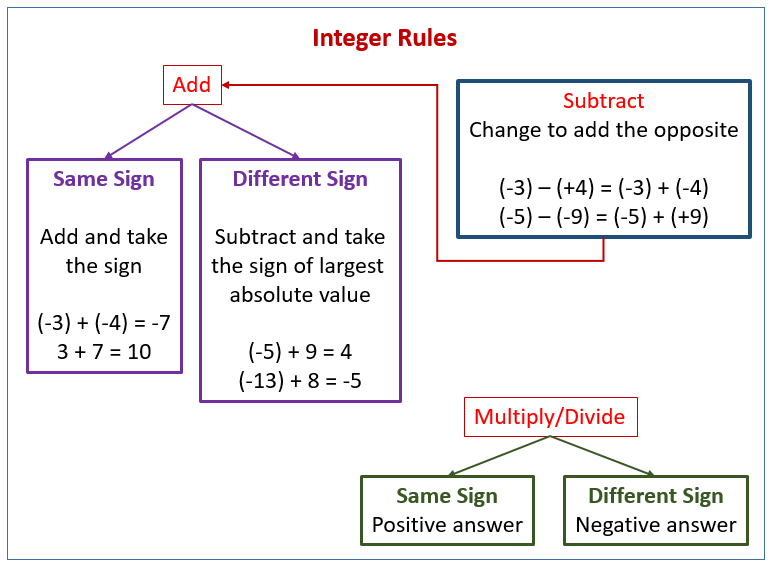 The following diagrams show the integer rules for addition, subtraction, multiplication, and division. Scroll down the page for songs, examples, and solutions. We can sing the following to the tune "Mary had a little lamb"
We can sing the following to the tune "row row row your boat"
Then, you'll will be exact. I never been so mad before. Come to find out I can't add no more. boom boom, out go the lights. Boom Boom, I don't know what to do. Adding Integers is like watching a war. The side that's gonna win is the side with more. boom boom - a bunch are gonna die. They are both on the same force so no boom - just shopping galore.